Risotto has been on my list of things to try making for a while now. Last Saturday, we went to my favorite Italian restaurant in KC, Bella Napoli, with a bunch of friends to celebrate a 30th birthday. I love going with big groups that are new to the restaurant because they order things on the menu that I've never tried. And it's near impossible for me to muster the strength to venture out of my comfort zone, despite the fact that everything there is exquisite. Enter Mushroom Risotto. One of the people we were with this last time ordered this, and oh my heavens, it was phenomenal. I haven't been able to get it off the brain since, and since cold, gray weather has been lingering, and lingering, and lingering, I couldn't deny making this warm, comforting meal for dinner. Risotto is a dish with legs. Give it a taste of spring by using asparagus instead. Or lemon and shrimp. Take it into fall by using roasted butternut squash. The process doesn't change, just your accentuating ingredients. And it's best to just wing it! You just add the liquid one ladle-full at a time until the rice is tender and creamy. This dish is hearty enough to serve as your main course, or it can be a first course or side. I think I might even have this for breakfast tomorrow morning! Risotto has quite the rap for being a time-intensive dish to make. That's not true. This was ready in just about a half hour. The reason some people have an aversion to making risotto is because it does require a lot of attention for that half hour. And by attention I mean stirring. I like to think that all that stirring negates the calories in the risotto. Won't you join me in my rose-colored world? Bring broth and water to a simmer in a 4-quart pot; keep broth at a bare simmer, covered. Heat oil with 1 tablespoon butter in a 4-quart heavy saucepan over moderately high heat. Add mushrooms and sauté, stirring occasionally, until browned, about 4 minutes. Season with salt and pepper, then transfer to a bowl. Cook onion in 2 tablespoons butter in saucepan over moderate heat, stirring, until softened, about 3 minutes. Add rice and cook, stirring, 1 minute. Add wine and cook, stirring, until absorbed, about 1 minute. Remove from heat and stir in 1/2 cup cheese, remaining tablespoon butter, and salt and pepper to taste. Gently stir in mushrooms, then cover pan and let stand 1 minute. 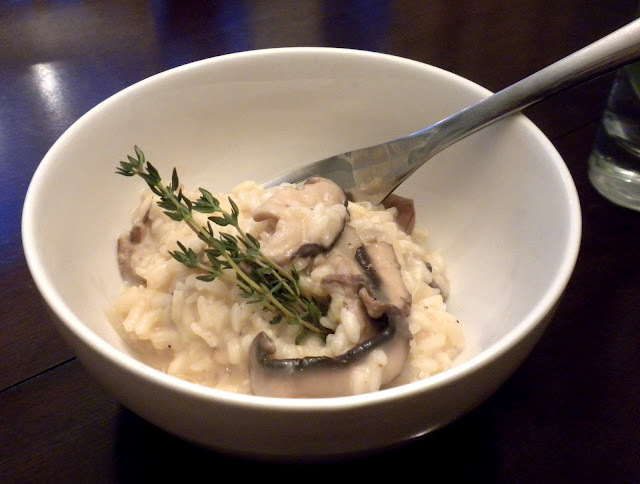 If desired, thin risotto with some of remaining broth. Serve immediately with remaining cheese on the side. Thanks, Desi! You made my day! 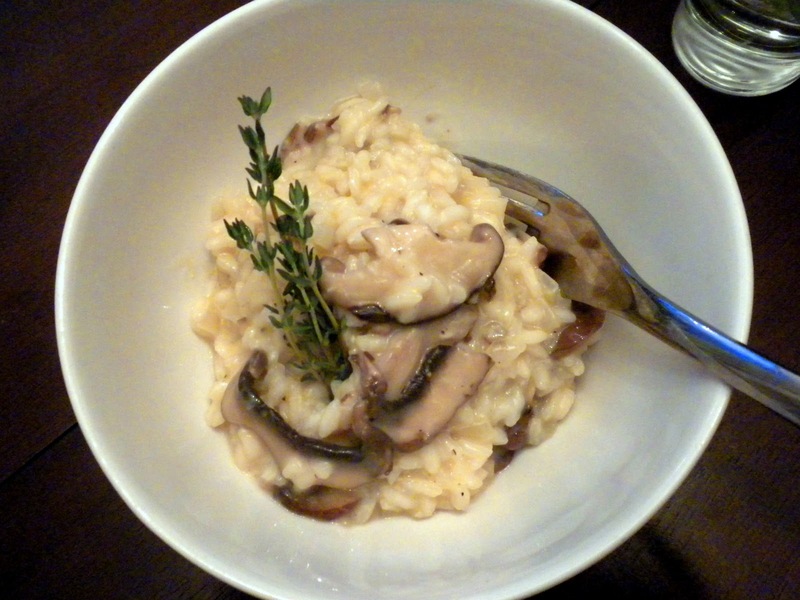 Lauren's a sweet lady - I'm flattered she included me in her risotto round-up.